Surrey, B.C. – The Surrey Board of Trade’s, 2nd Surrey Mayor’s Art Awards took place on June 15th, drawing close to 200 business people, artists, and the Mayor of Surrey, Linda Hepner, to celebrate Surrey’s creative industry at the new Civic Hotel in downtown Surrey. 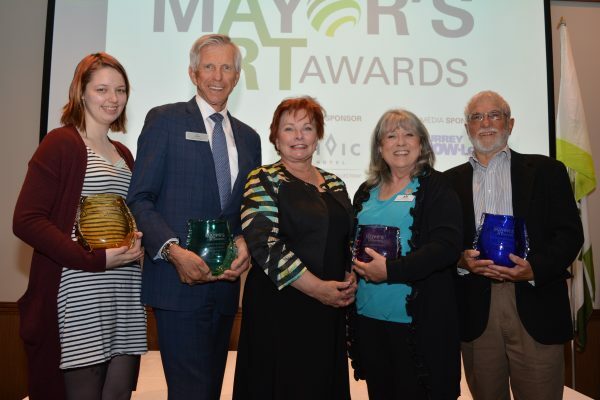 “The Surrey Mayor’s Art Awards recognize individuals and businesses that are committed to enriching Surrey through the arts, thus enhancing Surrey’s livability. The Surrey Board of Trade and the City of Surrey are committed to cultivating and sustaining a healthy and inclusive city and work towards ensuring that the cultural richness of Surrey is reflected through these awards, “ said Anita Huberman, CEO Surrey Board of Trade. Peninsula Productions was formed in late 2010 to help fill a need in White Rock/South Surrey for professional quality live entertainment. Since its inception as a not-for-profit society with a mere handful of dedicated members, it has become a vibrant organization with charitable status, an active board and over one hundred volunteers. As an arts organization they have actively sought to raise awareness of British Columbia’s rich multicultural identity through theatrical events. Ellie King has been making and presenting theatre, teaching, mentoring, consulting, serving on boards and volunteering in Surrey since the mid ‘80s. Through her many years of making theatre, Ellie has striven to redress the balance both on stage and as director/writer/producer. As a teacher and mentor, Ellie has been an innovator in this field, often volunteering her time. She was the first person to bring acting classes into Surrey Arts Centre in the mid 1980s. In terms of community involvement, Ellie partnered with the City of Surrey and together with the Royal Canadian Theatre Company, brought the first ever ‘Relaxed Performance’ staged at the Surrey Arts Centre in December 2017. Philanthropy Award Category Winner: Concord Pacific Development Inc.
Concord Pacific Development Inc. was formed in 1987. In the late 90’s, the group merged with the publicly listed Burcon Group, which controlled Oxford Properties that owned one of the largest office and retail portfolios in Canada. In the early 2000’s. Concord Pacific became a separate public company and was subsequently privatized. Beyond building homes and contributing parks, recreation facilities, amenities, school sites, seawall walkways and daycares, Concord supports the people in their communities through family-oriented events and charities, including Vancouver Jazz Festival, Surrey Fusion Festival, Surrey Tree Lighting and Indian Summer Festival. Concord Pacific has been supporting the Arts Umbrella since 1990. In 2012, Concord Pacific helped establish the Surrey Centre location of Arts Umbrella by donating funds to outfit the studio, providing rent-free space for many of Arts Umbrellas classes. Surrey Little Theatre was established in June 1959 when the Greater Whalley Recreation Council sponsored a little theatre group, The North Surrey Thespians. Their focus is to provide low-cost entertaining productions for Surrey and the surrounding communities. They provide 3 major productions per year, plus offer a number of additional youth programs, shows, and camps. Over the 59 years that Surrey Little Theatre has been around, they have won multiple awards in many different categories from the Community Theatre Coalition, Fraser Valley Zone Festival and at the Theatre BC’s Main Stage. Today, Surrey Little Theatre thrives not just as a historic landmark, but as an award-winning theatre group producing quality entertainment and opportunities for youth for the surrounding community. 4. And, their artistic and professional affiliations.